(November 27, 2018) — While the construction of a new research facility will commence at the Downtown Campus next year, it’s not slowing down the UTSA National Security Collaboration Center (NSCC) from taking shape. Federal and industry partners are now arriving on campus to work with UTSA faculty and students. With the goal to advance research, education and workforce development in the areas of cybersecurity, data analytics and cloud computing, the NSCC will create a collaborative and impactful ecosystem engaging government, industry and academia to solve the nation’s greatest issues surrounding cybersecurity. NSCC partners will have direct access to the technical expertise of UTSA faculty and highly trained students, and specialized facilities. Housed on the 4th floor of the North Paseo Building, the temporary space will be the National Security Collaboration Center’s first home and will expand UTSA’s ability to conduct applied research. An official ribbon-cutting took place on November 27 with faculty, staff, students, NSCC members and special guests. >> Learn how UTSA is building a national security powerhouse. NSCC members include industry partners IPSecure, LGS Innovations, CNF Technologies, Noblis, and federal partners Army Research Laboratory (ARL) and the National Security Agency (NSA). In 2017, UTSA welcomed ARL South Cyber, the Army Research Laboratory (ARL)’s corporate research lab to the campus. Two researchers – Ray Bateman, ARL South Cyber onsite Lead, and Kristin Schweitzer – have been embedded within the UTSA campus to facilitate research collaboration, and focus on all things cyber. 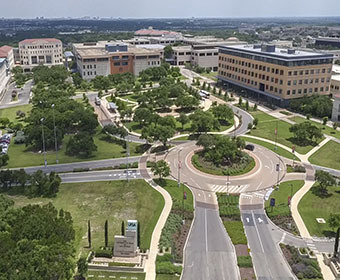 Having recently signed an articulation agreement with UTSA to create accelerated degree plans in cybersecurity and modern languages, and enhance workforce development in those fields, the National Security Agency has been embedded on campus since last year, conducting collaborative research with UTSA faculty and students. IPSecure provides cutting edge cybersecurity to government and commercial sectors for a safer experience and better world. As San Antonio’s largest cybersecurity provider, they pride themselves on innovation, offering security policy design to software development and everything in between. LGS Innovations creates advanced solutions in wireless communications, signals processing and analysis, optical networking, photonics, spectrum operations and management, routing and switching, and network assurance, with an expertise in C4ISR and cybersecurity. CNF Technologies Corp. focuses on securing the nation through world class research, development, integration and operation of cyber technologies. “This is just the beginning. Less than a year ago, this was an audacious idea and with our president’s vision and support, the NSCC has become a reality. By having federal and industry partners on campus, we envision our knowledge enterprise growing and helping UTSA reach Carnegie R1 research status,” said Bernard Arulanandam, UTSA interim vice president for Research, Economic Development, and Knowledge Enterprise. Learn more about the UTSA National Security Collaboration Center.